To reserve your date at Celebrations on the River, a signed agreement, reservation fee and damage deposit is required. Shortly thereafter, you will receive the initial Order Invoice and your Wedding Profile link. Names, addresses, cell phone and email addresses of the Bride and Groom? What room(s) you are renting? This online document contains all the written details of your event, from the venue’s perspective. This is what we refer to as the “bible”. All parties with the link can view, add and edit the Wedding Profile. Please fill in details as you make decisions. All details, including special requests must be in writing and finalized ten (10) days prior to the event. 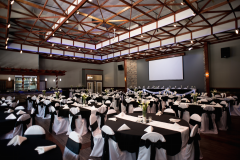 Meet with the Venue Coordinator to discuss the details of your event in the Wedding Profile and Order Invoice. Discuss 1st draft food and drink menu, catering decisions and special requests. Discuss 1st draft of floor plan, decorating ideas, colors and special requests. Discuss the event timeline, including arrival of bridal party, dinner, opening of bar, dance, etc. Discuss DJ/Band/Entertainment and other vendors. Discuss possible bachelor/bachelorette parties, rehearsal dinner, gift opening, etc. Arrange meeting with Venue Coordinator for 30 day review. Discuss updated details, review final decisions and update Order Invoice and Wedding Profile in detail. What is the updated timeline/agenda? What floor plan layout have you decided upon? What bar items would you like to host? Special requests? What dinner options have you decided upon? Caterer? What final vendors have you decided upon? What decorating needs and requests do you have? Linen colors? Arrange meeting with Venue Coordinator for 14 day final review. Meet with Venue Coordinator to review final details of your event, contained in the Order Invoice and Wedding Profile. Final review of Wedding Profile and Order Invoice. Final Beverage Special Requests Due. Final opportunity to make changes and update guest count. No changes are allowed within 10 days.